5052 Aluminum Plate for Aluminum cans are mainly used for carbonated beverages and beer with internal pressure of liquid packaging, with easy to pull the lid with aluminum alloy plate, aluminum strip more and more products, the use of more and more widely. China in July 2009 published the “easy to pull the lid with aluminum, aluminium strip” industry standards, haomei 5052 aluminumproduction is very consistent with the industry standards to meet and meet the needs of users and the market. 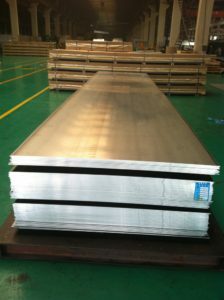 5052 aluminum alloy plate is aluminum and magnesium alloy, cold processing performance, with good molding processing performance, is a rust-proofaluminum plate, widely used. The strength of this alloy is high, especially with anti-fatigue strength, plasticity and corrosion resistance, in the semi-cold hardening when the plastic is still good. With 5052 aluminum alloy plate to do the cans of the cans need to do oxidation treatment, in order to improve the coating adhesion and corrosion resistance, both sides of the paint and then the lid forming process. Our company has semi-continuous casting production line 6, continuous casting and rolling production line 10, 44 other large-scale processing equipment; the annual output reached 450,000 tons. Production of alloy cans cover the surface quality is good, stable performance. 1, high plasticity, corrosion resistance, suitable for use in marine environments. 2, the surface without skin, bubbles. 3, no cracks on the surface, no corrosion spots and trace of nitrate. 4, 5052 aluminum plate In the heating process, the aluminum surface of the formation of less oxide, aluminum ingot utilization rate. If you want to learn more about the application of the 5052 aluminum plate in the cans, please call the sales hotline: +86-0371-656251391, haomei Aluminum will be happy to serve you. This entry was posted in Aluminum Sheet and tagged 5052 aluminum plate. Bookmark the permalink.